Message from the Property Manager. The VRBO website doesn't have the capability to show a free ($0) night but its included, the 7th night has been removed from the sub-total amount before taxes and fees. After removing the free night, the remaining total is divided over your entire stay. Please book in confidence that you are receiving a free night! Long stay special: Pay for 6, get the 7th night free! Valid on new reservations, for travel now through April 18th, 2020 (Blackout 12/19 - 1/4/20). 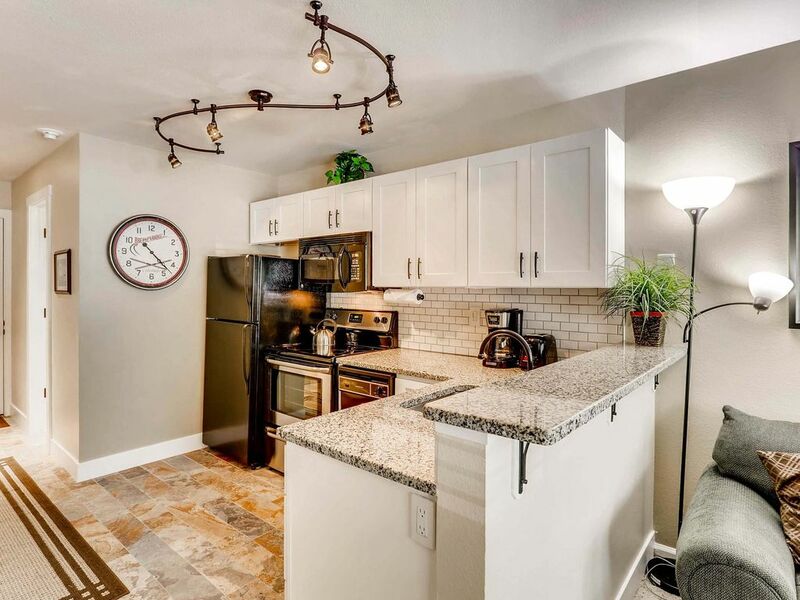 You will be stunned by the comfort of this recently remodeled ground floor, one bedroom one bath condo. The gourmet, granite countertop kitchen is fully equipped with exquisite glassware, dishware, and cooking utensils that you will need to make, and serve, your favorite home-cooked dish. This one bedroom unit offers all the necessary appliances; microwave, stove, oven, dishwasher, refrigerator and coffee maker. Enjoy your meal in the comfort of your own unit at the high-top table with seating for four people. The large couch and oversized side chair are sure to provide the relaxation you deserve on vacation, whether watching a DVD movie on the 42" flat screen TV or reading your vacation book, you feel right at home. The bedroom offers a luxurious Queen bed encased in comfortable bedding with a 32" flat screen TV. Between the bedroom and the Queen sofa sleeper provided, the unit can accommodate four people. After a long day playing outdoors, enjoy a hot shower or relaxing bath. The Wildwood Suites offer more than just a supreme location. You'll find this condo beneath the evergreens as a four-season escape on the edge of the Four O'Clock ski run at Breckenridge. Being steps from Main Street, spend your afternoons strolling, dining, shopping and exploring all that Breckenridge has to offer. There are other amenities offered by the Wildwood Suites building such as FREE WiFi, an outdoor shared hot tub, a shared sauna, on-site coin operated laundry facilities and a relaxing common area with a gas fireplace. Traveling with a furry companion? This unit is also dog friendly! woof! This property is dog friendly! Pet Fee: $50 per dog/per stay. Maximum 2 dogs (100 lb weight limit). Please note: Unit 206 is located on the second floor of the building and runs a little warm due to its proximity to the laundry room and sauna below. If too warm, you may have to open a window and turn on the ceiling fan. We are ski country resorts! We are not just lodging specialists, we are Breckenridge enthusiasts! We are vacation specialists & our goal is to help you vacation with a purpose! Allow us to help plan your Breckenridge summer or winter vacation. From finding the perfect accommodations for your family or group to helping with car rentals or airport transportation our friendly and knowledgeable staff can help take the headache out of vacation planning! Sit back, let us recommend, help plan and book some of the exciting activities that are unique to Breckenridge. From tubing, snowmobiling, dog sledding, whitewater rafting, zip lining, horseback riding, scenic train tours and so much more! Our full service concierge staff is here to help! Planning a special occasion? From dinner recommendations and reservations to welcome baskets, spa appointments...Whatever you can dream we can make a reality! So don't leave your vacation to chance - trust the experts at ski country to ensure your Breckenridge vacation is free of stress and worry. With 25 years of experience, we promise to make it our goal that your Breckenridge stay is a relaxing and enjoyable one – just as a vacation should be! Boasting 300 days of Sunshine in Winter and Summer, Breckenridge is the perfect retreat all year round! This unique and charming town offers something most Ski Towns don't - A TOWN! Sure, we have a world renowned Ski Resort in our backyard... But we're so much more than that! Breckenridge is rich in history. Having started as a mining town in the late 1800s, Breckenridge has seen a lot more than just the transition from single seated chairlifts to Quad SuperChairs and Gondolas… You know that saying “If these walls could talk?” We’re sure that’s how every meticulously maintained building in our Downtown Historic District must feel. We, as locals, work hard to preserve the history and feel of this Victorian Style themed town and many of the buildings lining Main Street are originals from the old mining days. The Breckenridge locals are proud of their town’s past and eager to tell stories of its colorful history. We also encourage visitors to take part in one of the many historic tours that Breckenridge offers, either by foot or horse drawn carriage or sleigh. So come, experience for yourself the magical town of Breckenridge. Indulge in some of the best restaurants you have and ever will experience, take pleasure in strolling up and down Main Street and window shopping all of the rare and unique shops that it offers, join us for one of our crazy annual festivals – such as the zany Ullr Festival, where we give praise to the Nordic God of Snow in hopes that he will bless us with a snowy ski season. Oh, and while you’re here, get out there and explore our 5 peaks of 2,900+ acres of world renowned ski and rideable terrain! Four O'clock trail from Peak 8 to town runs directly behind this property offering ski-in access during the winter. Perfect location! Had a little housekeeping issue on arrival that was handled promptly with 1 phone call! Would def book again. Loved the pet friendly atmosphere!!! The week we stayed,the condo facility was filled with pets and their parents which I loved. The location of the condo to town was convenient and easy to access dinner, shopping and groceries. My husband loved the "ski-in" access via the 4 o'clock run. The bed was super comfortable. The only issues I had with the condo were minor. I travel with pets frequently and stay at pet friendly VRBO's all over the USA. I don't expect a pet friendly condo to be on par for those who don't have pets. With this being said, the condo's carpet did have several visible pet accident areas that would best be treated with a steam cleaner prior to next visitors arrival. Another pet friendly plus, the condo has several pet waste stations with all th poo bags you could ever use. My husband and I enjoyed this cute little condo during a weekend trip. It is well stocked and close to EVERYTHING. The bed was comfy and the kitchen and bathroom were nicely updated. Like others have mentioned this unit is hot! Honestly there isn't anything that I see that can be done. It sits above the laundry room so I assume that is why it's warm. The unit does have a box fan and overhead fan and we did have to open a window one evening. The hot tub is lovely after a nice long day of skiing. Overall, we would rent this unit again. The condo is in a nice location, was clean, and was nicely furnished. The main issue is that the toilet wouldn’t flush at all (we used the restrooms on the liwer level) and that the heat/cooling could not be regulated. This unit sits directly over the sauna and is extremely warm at all times. A ceiling fan in the bedroom is badly needed.